Australia’s largest liquor merchant. And the best liquor website in Australia. 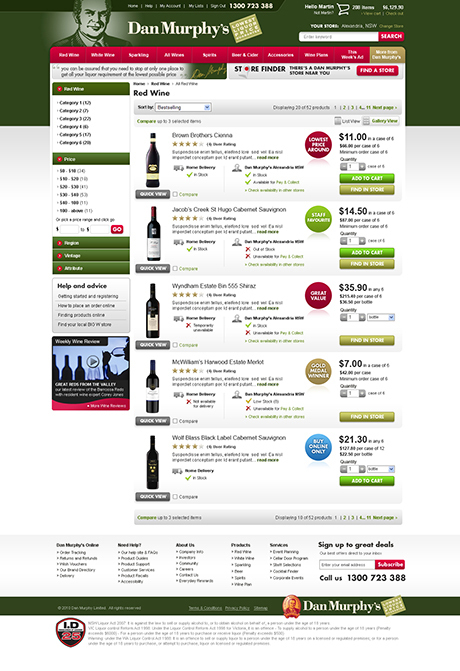 ‘Nobody beats Dan Murphys’… especially not online. Best-practice consumer eCommerce design. Best practice product ranging. Best practice cart and checkout. Flexible enough to adapt to new functions, carts and delivery types. 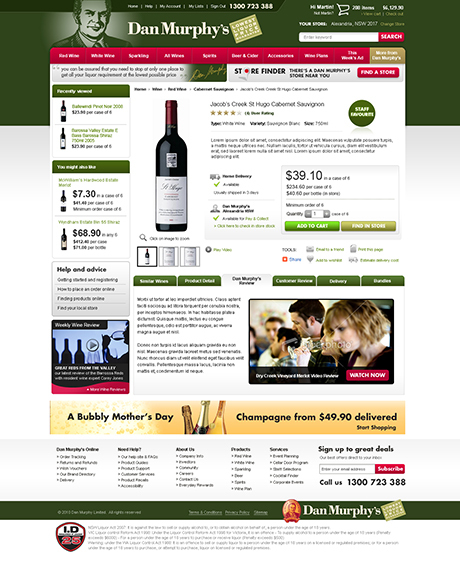 Liquor is an enormous category online and Dan Murphys is the destination more people visit that any other. Working closely with the backend integration partner, Wiliam planned, designed and developed the front-end of the Dan Murphy’s website; the full user experience. This was a considerable feat given the variables and permutations existing across their impressive range of products. Some products are available for pickup in store, many products are available for delivery. In some circumstances, even if a product is out of stock, it can still be delivered! Ensuring that users see the right price and stock availability without obtrusively asking for their location and details is quite a challenge. 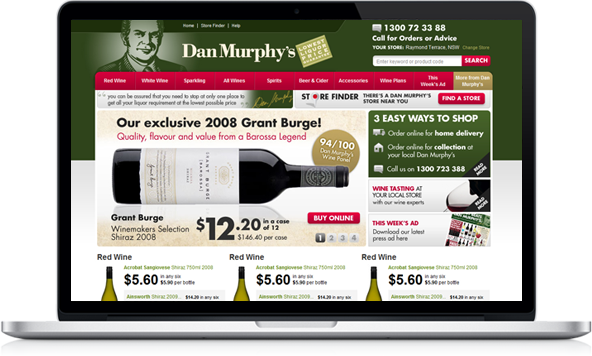 After considerable planning and analysis, Wiliam designed an interface that simplified the process to the extent that a Dan Murphys’ customer can always be sure that they’re looking at the right information right through to checkout. The project result is inarguably Australia’s largest, and best online liquor website. The close collaboration of Dan Murphy’s, Wiliam and the backend integration partner has delivered an online experience, as good as walking in-store. In fact, it’s arguably better! We help businesses, organisations and individuals bring their projects to life.